When it comes to word working, there are a variety of different ways you can accomplish your goal of making the necessary cuts to complete your project. You can use hand ﻿tools or tools which sit on the floor; every kind of tool is basically available in both formats. However, they may not always go by the same name. This is truly the case with the Band Saw and the Scroll Saw. When you look at what each machine does, there are a lot of similarities – however, there are some key differences as well. These differences are accentuated with how each machine operates, and what kinds of cuts are best for each machine. Within this guide, we are going to showcase what each saw is capable of doing, as well as what kinds of cuts are best. We’ll also go over some of the most important features you should be on the lookout for with each saw. Lastly, we’ll review some products for you, so you can see what is in the marketplace currently, which should help you determine which kind of saw is best for you. A Band Saw is often compared to a Jigsaw, in that it allows you to move the piece of wood or the blade in a way to where you get the right cut you are going after. The Band Saw comes in size where it can stand on its own and operate off of a table or a stand, or it can be fully upright. The blade on the band saw is a continuous blade of teeth, so that you will never wear out one particular area of any blade. The blade is typically stretched, which allows you to maneuver the wood in an easier fashion in order to get the curvature you desire with any project. However, the diameter of any cut it can make is fully dependent upon the width of the blade, as well as a feature called its Kerf. Most people, when they think of Kerf, often only think about the width of the saw blade. However, to do so is to be misleading. 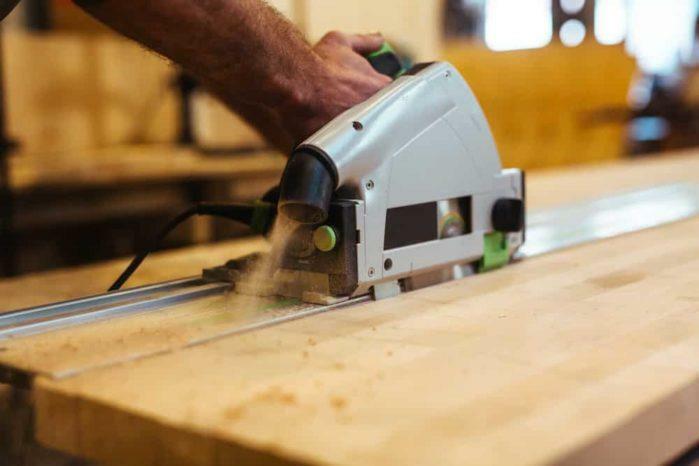 You need to ensure you have a full understanding of kerf, so when you have to buy a replacement blade for your Band Saw, you know the type of blade you actually need to have in order to have a successful project. One variable with the band saw is how many wheels are used to help move and power the blade around. More times than not, only one wheel is actually moved by the power source – the rest of the wheels are moved by being attached to the blade, and having the blade stretched so far to where the wheel has no other option but to move (basically a pulley system). There are a few different types of band saws which are available. The most common type of band saw is one that is used for cutting wood. This type of saw also has the most types of blades available to you. The other types of saws which are available include ones which are Head Saws (used mostly at lumber mills), Meat Cutting and Metal Cutting. When buying a new blade, you need to ensure it will cut the kind of product you need cut, as well as fit within the saw. One last thing to look for on blades for a Band Saw is the Teeth per Inch. The fewer the amount of teeth, the more coarse the cut will be within the material. Likewise, the most teeth you have on the blade, the finer the cut will be. Depending on the material you have, and how smooth you need the cut to be, should determine the number of teeth on the blade. In comparison to the Band Saw, the Scroll Saw is smaller in size. It is typically a tabletop unit, or can operate directly on the ground. In addition to this, the Scroll Saw is even more like a ﻿﻿jigsaw or a reciprocating saw, as the blade moves back and forth, rather than in a continuous loop. This is perfect for when you need to make a cut in an item where you need to start within the piece you are cutting rather than having to cut from the outside in. The power source is typically an electrical outlet. One of the best features among any Scroll Saw in comparison to other saws is that you can easily adjust the speed of the blade by pressing down on a pedal. Rather than being captive to pre-set speeds on the saw, by having the ability to press the pedal down, you can determine the speed at which the blade moves. Having the ability to fluctuate the speed allows you to make certain cuts much easier and cleaner. In addition to this, the number of teeth on a blade tends to be more numerous in comparison to a Band Saw. The extra number of teeth allows you to have a very fine cut within any material, ensuring you need to do minimal sanding, if any at all. The major thing when looking at a scroll saw is the size of the scroll saw. The size is determined by the distance between the rear of the saw up to the blade; often times, you will hear this size referred to as the throat. The larger the throat of the scroll saw, the larger the actual base of the saw is. There are advantages to both smaller and larger size throat scroll saws. It’s important for you to find the right size of saw which best meets your own size, as well as the size of the material you are working with. Lastly, the feature of a scroll saw that is typically different than the band saw is that the table on the scroll saw can actually rotate. This makes it easier to maneuver the material as you need to, so you can get a very precise cut. There is typically a locking mechanism on the table, so you can be confident in keeping the table stationary as needed, or rotate it around to give you the best cut possible. The table on the band saw from Skil can actually tilt, which means you can make cuts into the material, rather than straight 90 degree cuts. You will also get a fence you can put on the table, which allows you to make quick, straight cuts into your material. Along the band saw, your work can be illuminated by the LED light, which allows you to see clearer and brighter along the material you are cutting. A very unique feature to this Scroll Saw is the ability for you to cut a piece in either direction. This allows you to have an infinite number of possibilities when it comes to cutting your material. The table is 16” x 11”, which is large enough to hold most materials you are cutting into. You can cut material which is 2” in height, and the throat size of this scroll saw is 16”. This Band Saw option from Rikon is actually a scaled down version of their most popular and longest lasting industrial band saw. The motor is powered by 1/3 HP, which allows you to cut into even the most dense of items. The cast-iron table is quite large, as it is 13 ¾” x 12 ½”, meaning you can work with most types of blocks, whether they are made out of wood or metal materials. There is also a groove which allows you to use a fence, meaning you can rip the boards with ease. The tension within the band system is automatic, meaning it will adjust to the proper amount of tension needed with any blade. There is also a control which allows you to vary the speed of the blade, giving you the option to adjust the speed as needed to cut thru the materials you are working with. This scroll saw also comes with a port for the dust, which allows you to easily clear the table and keep it clean. The base of the scroll saw is designed in a way to easily lock onto any table or surface as needed, making this power tool a great portable option. When it comes to choosing a saw which will allow you to make rips, as well as giving you the capability to make delicate curve cuts, then going with a band or scroll saw is the perfect choice. If you need to make more precise cuts than normal cuts, then a scroll saw would be the best option. If you want a more versatile saw, then going with a band saw will function for you in the manner you desire. Once you choose a band or scroll saw, or both, please let us know which one you have, and show us your work so we can share that with others!